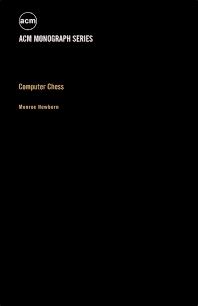 Computer Chess deals with the history of computer chess games and the programming of computer chess. Topics covered include chess programs such as the one initiated by Richard Greenblatt and those launched by the United States and the USSR in 1966-1967. The United States Computer Chess Championships from 1970 to 1973 are also discussed. Comprised of 10 chapters, this book begins with a historical overview of the basic ideas underlying computer chess and several of the earliest computer games. The next chapter deals with the chess match held in 1966 pitting the Kotok-McCarthy Chess Program of the United States and the ITEP (Institute of Theoretical and Experimental Physics) Chess Program of the Soviet Union. The reader is then introduced to Greenblatt's program, named Mac Hack Six, the first chess program to compete respectably against humans in tournament play. Subsequent chapters focus on the U.S. Computer Chess Championships, from its first edition in New York in 1970 to the fourth, held in Atlanta in 1973. Russia's chess program called KAISSA, an improved version of the ITEP Chess Program, is also described. The final chapter is devoted to OSTRICH, a chess-playing program written by George Arnold in the Digital Computer Laboratory of Columbia University's Department of Electrical Engineering and Computer Science in 1971. This monograph will be of value to computer science and those interested in computer chess programs and in the broader field of artificial intelligence.